Health outcomes may depend on which treatment is received, whether choice of treatment is given, and whether a received treatment is the preferred therapy. We examined the effects of these key factors on the EuroQol-5D (EQ-5D-3L) in patients with PTSD. Two hundred patients aged 18–65 years with PTSD diagnosis enrolled in a doubly randomized preference trial (DRPT) examining treatment, choice of treatment, and treatment-preference effects of prolonged exposure therapy (PE) and pharmacotherapy with sertraline (SER) (clinicaltrials.gov Identifier: NCT00127673). 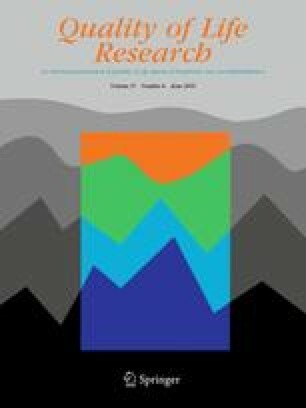 We performed difference-in-difference analysis to estimate the treatment effects of prolonged exposure therapy (PE) as compared to pharmacotherapy with sertraline (SER), receipt of choice versus no-choice of treatment, and receipt of preferred versus non-preferred treatment on health-related quality-of-life (HRQOL) outcome using the EQ-5D-3L completed at baseline and 10-week post-treatment. The treatment effects of PE on the EQ-5D scores in overall patients and subgroup of patients who preferred PE were 0.150 (p = 0.025) and 0.223 (p < 0.001), respectively. The effects of treatment choice were 0.088 (p = 0.050) and 0.156 (p = 0.043) in overall patients and subgroup of patients received SER, respectively. The effects of treatment preference were 0.101 (p = 0.038) and 0.249 (p = 0.004) in overall patients and subgroup of patients SER, respectively. Overall, PE is associated with better improved HRQOL, especially in patients who prefer it. Independently, allowing patients to choose their preferred treatment resulted in better HRQOL than either assigning them a treatment or giving them a treatment that is not preferred. Primary findings of this study to be presented in part at the annual meeting of the Society of Medical Decision Making, Miami, Florida, October 19, 2014. The online version of this article ( https://doi.org/10.1007/s11136-018-1833-4) contains supplementary material, which is available to authorized users. This research was supported by Grants R01MH066347 and R01MH066348 from the National Institute of Mental Health (“Effectiveness of PTSD Treatment: Prolonged Exposure Therapy vs. Zoloft”). The study was approved by the Institutional Review Boards (IRB) of the Case Western Reserve University/University Hospital of Cleveland and University of Washington. All procedures performed in studies involving human participants were in accordance with the ethical standards of the institutional and/or national research committee and with the 1964 Helsinki declaration and its later amendments or comparable ethical standards.